". . . there was a place called Golden Nugget [The Gold Nugget Restaurant and Lounge] . . . we knew the food was delicious but we couldn't go in, so we went to the side door and knocked on the door when they came, when they got a chance, they would come and take your order and they would give you the food from there." Faye Vickers talks about her family and her mother’s background in Homewood. She also describes the self-contained community of Rosedale and how it has changed over the years. Faye Vickers recounts common activities for young adults in Rosedale. Faye Vickers lists some of the major businesses in Rosedale, as well as common means of employment. Faye Vickers talks about the church’s role in the Rosedale community and the history of Union Baptist Church. Faye Vickers discusses the history of schools in Rosedale, the founding of Rosedale School, and its eventual integration with the Homewood school system. Faye Vickers discusses the complications of Rosedale School’s integration into the Homewood school system and Rosedale’s involvement in the Civil Rights movement. Faye Vickers talks about Rosedale School as a center of the community, as well as tension between Homewood and Rosedale. Faye Vickers describes Rosedale’s annual May Day celebration. Faye Vickers talks about sharing memories at the Rosedale reunion, and recalls the Rosedale Picnic Club. Faye Vickers discusses how the Rosedale community is changing and her hopes for its future. Faye Vickers talks about some of her most prominent memories of Rosedale, including skating at Christmas, Halloween traditions, and the influence of Dr. Mamie Foster on the community. CHASE TRAUTWEIN: I appreciate you taking time out of your day to come and talk a little bit about Rosedale. So were you born in Rosedale? FAYE VICKERS: All my life, I spent all my life in Rosedale. I wouldn't say all my life, uh, yes. CHASE TRAUTWEIN: Yeah (laughs). And were your parents from Rosedale? FAYE VICKERS: Yes, mmhmm. My mother was born in Rosedale and went to school there, still lives there in the home house and, home house is the home, the house that the entire family was born and raised in, so she still lives there. CHASE TRAUTWEIN: OK and what did your parents do for a living? FAYE VICKERS: My mother, uh, was a homemaker. She, ah, she worked in private home and she also was what we called the community seamstress, so she, she was a community seamstress. She took in sewing and that's the way she supplemented the income. Yeah. CHASE TRAUTWEIN: Mhmm I imagine, a pretty important person because if someone ripped something or needed clothes fixed. FAYE VICKERS: Absolutely, absolutely. She did all of that and I never learned to sew. I watched her, I know everything about it, I just didn't ever do it and now I regret that. My mother's ninety-one, going on ninety-two and she's still fairly healthy. She lives alone, she still takes care of herself, she does well for a person her age, and now I keep saying "Gosh, I wish I had learned to do that. I wish I had learned to do that." But I didn't, so, but she still sews for me as a matter of fact. CHASE TRAUTWEIN: Man. so that's a skill she has learned and held on to. FAYE VICKERS: Absolutely, that's right. CHASE TRAUTWEIN: And, um, did you, do you have any siblings, any brothers or sisters? FAYE VICKERS: I do, I have one sister that lives in Cleveland, Ohio now, but she was born and raised in Rosedale, went to Rosedale School and I had four brothers. I have two left, two of them passed away from cancer. As a matter of fact, my youngest one just died last year, about a year ago, but yeah. CHASE TRAUTWEIN: And you mentioned Rosedale School, did you go there as a child? FAYE VICKERS: Yes, first to twelfth grade, I did. CHASE TRAUTWEIN: So what was that like? FAYE VICKERS: It was great. I didn't know it was great when I was going. I realized it was great until I left, you know, and I went off to school, well, went to school, and I was told, "Oh, so you're privileged." And I said, "Privileged? What do you mean privileged?" You know, because Rosedale is a little pocket that sits in, right in the hub and a lot of people didn't even know the community was there, so when I graduated high school, I went to Miles College and they asked, "Where do you live?" And I said, "I live in Homewood." And they said, "Yeah right, no black people in Homewood." I said, "Listen, I live in Homewood." And they'd say, "Quit lying. You do not live in Homewood. Where do you live?" And I kept saying, "I do." Because at that time, we didn't necessarily associate the community with Rosedale was the city of Homewood so we called it Homewood, but the community was known as Rosedale and, um, they said "privileged" because it was a self-contained community. Nothing like what it is now. It's nothing like, I almost don't recognize it now, but self-contained meaning that the school was there, first to twelfth grade, so we didn't have to go anywhere else, our churches were there, our teachers, for the most part, lived in the community and they went to church with us as well. The shopping center, the Homewood shopping center was where we shopped, all the grocery stores were there, our doctors were there, so we had no reason to go into Birmingham for anything, so I guess that's why they called us privileged, you know but I didn't think so at the time. CHASE TRAUTWEIN: Y'all didn't need to go somewhere else. FAYE VICKERS: Didn't need to. Everything that we needed was right in Homewood or in our community of Rosedale. CHASE TRAUTWEIN: So it sounds like, everything I've heard about it was that was a very close knit place too. FAYE VICKERS: Very. Very close knit. Mhmm, Mhmm. CHASE TRAUTWEIN: And it seems like that even today. FAYE VICKERS: It is, well the people that are left. A lot of people that live there now, people who have come there from other places, passing through. They're not people who are what I call grassroots or they have any connection with the neighborhood, they just, I still go to church in Rosedale, as I said, my mother still lives there and I do everything in Rosedale except sleep. I live somewhere else but I'm there all the time, you know, I get involved with the community affairs and everything, so for the most part, I knew the majority of the people that lived in the community because it was a large community but with encroachment, then a lot of houses were taken and, um, and the freeway, Red Mountain Expressway did not exist when I was a child. The pump house road was there and the pump house, now what separated the community was the pump house and Rosedale, then the pump house, and then that's Shades Valley High School was right there, building right to the side of Red Mountain Expressway, but Rosedale extended all the way down where the Embassy Suite is right now, houses were all up in that way and, um, at the end of Loveless Street and beyond where the Montessori School is now, houses, Rosedale houses were there, all the way up to Valley View, so it was a very large community and, um, but again, like I said, business encroachment and businesses came in, and so therefore, the backyard was a business and it went down smaller and smaller. Then homeowners, because the neighborhood basically were all homeowners, with the exception of the family, the Lee family, that owned most of the rental property, but all the other people were home owners, so with so much business encroachment many of them left or those that did not leave, they passed away and the property just sat idle and it was condemned, so the city of Homewood was able to acquire that because the property was condemned and it was, you know, no taxes were paid, so the city was able to acquire that property, so the community got smaller and smaller and like I said, people who had no connection to the community, no connection meaning no real roots, they just lived there, but they had no hard connections to the community, didn't make them any difference. So a different kind of people moved in. When I say "different kind" they had different objectives and they didn't care about how slummy it started looking or they didn't care about crime that creeped in. It didn't make them any difference because they had no connection, no commitment or anything to the community. CHASE TRAUTWEIN: Yeah. It's different if you've grown up there I imagine. FAYE VICKERS: Very different. Very, very different. Right now I feel very different about say some people in the neighborhood now and I go in and I look and I ask Mama, "Who is that? Where do they come from?" And she says, "I don't know." And I worry about it now. I worry about her living alone because people used to know each other and they used to, as a matter of fact, when I grew up we didn't even lock the door. We didn't. CHASE TRAUTWEIN: Yeah I've heard that and I've heard that it didn't make any difference if you did because everyone had a skeleton key. FAYE VICKERS: A skeleton key. A skeleton key. We'd just say, "Is that the key to my house? I can take my key and go in your house too" because it fit and we bought them from V.J. Elmore or the, uh, the hardware, the hardware store, Huffstutlers, Huffstutlers. Huffstutlers is still in the community but it's now at the end of Loveless Street. It's a different kind of store now but you could go in and just get a key and either it bent this way or that way so if this key didn't fit, everybody used the same key. I mean, nobody would go in anybody's house, they wouldn't steal your property and again, it was so hot when we were growing up, we didn't have air conditioning, we had fans, so we would let the windows up and open the doors and everybody went to sleep and everything was wonderful. I wouldn't dare do that now. I wouldn't dare do that now, even with a burglar alarm system, I'm afraid, so it's very different. Like anywhere in the world. You hear other people talking about communities and what it used to be, nothing is as it is now, because the world is so different but a community like Rosedale is, it just started diminishing and it never recovered and, um, that's why I think it is the way it is now. CHASE TRAUTWEIN: Um, this is backtracking a little bit, but growing up there, um, did you, what was it like growing up as a child? Um, did you know everyone on your street or on the block? Um, from what I've heard, everybody was very active, that there was always something to do, whether it be sports or school or chores or what have you. FAYE VICKERS: Because of the kind of neighborhood it was, then we had to be creative in finding things to do. The hub of the community was the community center, so the majority of the activities that took place for the community was at the community center, that is the Girl Scouts, the Boy Scouts, the basketball, the community basketball, boy and girl teams, all of that was out of the community center and then they would, we had something called a teenage club. We could not wait to get to be thirteen years old because we got in the Teenage Club and the Teenage Club was a group of kids and we would plan activities and we would go on trips like to Lookout Mountain in Tennessee or we would go to Six Flags, I don't think that was even built then, but we would, or we would go to Little Jerusalem. That's a little place, I think that was in Gadsden or Gadsden had another little place that we would go. I think it's still there but we would take trips like that. And then the churches were very involved, so we would have vacation Bible school that would last two weeks, so this church would have it two weeks and then later then that church would have it for two weeks and then we would and then when there was just nothing to do, this is before we, the swimming pool was built, because, because we were in Rosedale and we grew up in a very segregated environment and we knew where we lived and what we were allowed to do and what we were not allowed to do, so we would go for walks. That's unreal now, the kinds of walks we went on, we went on long walks. We'd leave our community Rosedale and walk up to Vulcan. That was a big thing, I mean, on Sunday evenings we'd go to church and come home and change clothes and we would go to Vulcan and we would get to Vulcan and we would get up there and drink water and rest and then we would just come back and that was just thrilling, that was just great. (phone rings) Oh, I'm sorry. CHASE TRAUTWEIN: Oh you're OK. FAYE VICKERS: Just cut my phone off. CHASE TRAUTWEIN: If you need to take that I mean it's... FAYE VICKERS: I do not. I don't know what's happening, I need to check it when I get home. I think I've received twenty-five calls today, but not twenty-five, I'm exaggerating with that number but I know it's at least ten and each person is asking about insurance. They say, "We received your request online about health insurance." I haven't called anybody about health insurance. Everybody says the same thing and they continue to call and continue to call and it's several different companies so I don't know what that's about, but anyway, we used to walk to Vulcan, then we would go to the Homewood shopping center and we would go for walks up there and we would just go in the stores from the front to the back because it was always so cold and that was our way of cooling off and we would leave the drug store which was on the corner and then we would go down to V.J. Elmore. V.J. Elmore is the Walgreen, now, you're so young, you probably don't know what that is, but V.J. Elmore was the five and dime that sold everything and next to that was the hobby shop and, um, and the Homewood shopping center, I tell you, was a fantastic place to shop, because it had everything you needed. They had a grocery store which was A and P Grocery Store that was on the top of the hill near Ridout's. You know where Ridout's is? CHASE TRAUTWEIN: Yeah. Mhmm. FAYE VICKERS: Well that was an A and P Grocery Store, that was up there behind Ridout's and there was another ShopRite which was at the bottom of the hill that was next to the drug store, Homewood Drugs, and so these were the larger grocery stores, so the grocery stores that you needed were there, the hardware stores were there, the hobby shops, all of the kind of hobbies. They had E.E. Forbes and E.E. Forbes was a big piano company that sold pianos, so it was just wonderful to just go and window shop and we just did stuff like that to entertain ourself while we were out of school for summer. There were not a lot of organized activities through organizations, so all the churches did not, everything did not come out of the community center for us to do, um, we, that's what we did. Our parents didn't have a lot of money, you know, some people went to visit relatives out of state for maybe two weeks and that was just a big thing. "You are going to Chicago? Really?" CHASE TRAUTWEIN: That's another country. (laughs) FAYE VICKERS: That's right, absolutely, it was, and when they came back, we just say in their faces, "What did you do? What is it like?" You Know, so, so I mean, we looked forward to that. We were not upset because we all did the same thing, so we just thought it was s way of life, this is the way we do it. There were things I would say we were limited to. There were a lot of nice restaurants in the city of Homewood we could not go to. We could go to the back of the door, like, there was a place called Golden Nugget that, if you get on Eighteenth Street now and you go up there's the Jefferson County Board of Education sits there, you know where that is? CHASE TRAUTWEIN: Mmhmm. FAYE VICKERS: OK that used to be State Farm Insurance Company and that's where their home office was. It was a large company. Right next to it was Golden Nugget and that was a big, big restaurant. They sold delicious food and a lot of people from the community worked there, so we knew the food was delicious but we couldn't go in, so we went to the side door and knocked on the door when they came, when they got a chance, they would come and take your order and they would give you the food from there. Next to it was the Homewood Creamery. The Homewood Creamery is like, um, Dairy Queen is right now. Dairy Queen? CHASE TRAUTWEIN: Yeah, mmhmm. FAYE VICKERS: But they only sold ice cream. They didn't sell sandwiches and they sold the best milkshakes in the world. The tallest ice cream cones in the world and they had this big window for patrons to come to and they had a very small window a little further down for us, so we didn't think about it, we didn't care, we wanted the good ice cream, so we would go to the small window and buy that ice cream. It was the best ice cream, and finally they went out of business, but again, Homewood has always been a great place to live and our neighborhood was, we thought, at that time, that it was just wonderful. We really did. Despite all of the disadvantages that we didn't know we were having disadvantages until we got older and we started to comparing. Most of the ladies that worked in the community, there were, there were some professionals. You see, in the community also there were professionals, non-professionals, there were domestics, there were career people, military and such, all in the same community, so we had examples of everything. Our mothers that worked within the city of Homewood and worked in Vestavia and worked in Mountain Brook as housekeepers, as maids, you know, they, believe it or not, they took on the attitude of the ladies they worked for, so, you know, my mother worked for this lady who dressed very well and she was very nice to my mother, so my mother would go and look at her clothes and come home and make them. She couldn't go downtown to buy them, she would look at them and see how they were made and so she said, "This is what Ms. Walker wears. Look at this suit. I'll make me one." And so therefore they took on a lot of the, I couldn't say personality, but some of the qualities that they worked in their home they took, and they brought that to their home, so they wanted the same thing for their children, but they didn't, they couldn't afford it but they learned what they did and brought that to their children in some of the homes. CHASE TRAUTWEIN: Interesting. So there was some kind of influence from outside of the home or outside of their home neighborhood. FAYE VICKERS: Exactly. Exactly. Exactly. A lot of influence. Mhmm. CHASE TRAUTWEIN: That's interesting. You, earlier you had mentioned the churches, that they played a big role in the community. FAYE VICKERS: Very much, very much. CHASE TRAUTWEIN: And did you go to one particular church? FAYE VICKERS: And still do. And still do. Same church. I've been going to one church my entire life. Same church and that church, the oldest church is Union Baptist Church. That church is older than 100 years old and that church had a split. You know what I mean when I say "split?" CHASE TRAUTWEIN: That the church went to another, well-- FAYE VICKERS: Yeah, it split, I mean, I knew you knew what the word means. They had change of leadership and so some people didn't like that leadership so they branched off and they established another church up the street, I mean walking distance. Closer than my car is parked. CHASE TRAUTWEIN: Far away (laughs). FAYE VICKERS: And that's right, so they used to have another church. That's the church that I belong to. My grandmother and my great grandmother was part of that original church because my great grandmother was born in Rosedale. Well she wasn't born in Rosedale, she was born in Georgia, but they planted their family in Rosedale. They were one of the earliest settlers there, so she had my grandmother there in Rosedale, of course she had her family and so on. So she was part of that original church and my grandmother was too, but when they had the split, my grandmother left and went to the other church and then all of my grandmother's children and all of my cousins and all of us belong to that church as a result of the split, but they played a very integral role in the community because they knew how important the church was, um, you know in spiritual life as well as every aspect of your life really, every aspect. So therefore you grew spiritually and then after that they encouraged you educationally because Rosedale was a very small school. I don't know if Ms. Jones told you but Ms. Jones and I have been friends all of our life. We met at five years old, so we have had a, we have a friendship that spans beyond sixty years and we went to school together except for when she went to college. She went her way and I went mine, but we still maintain our friendship so we have done a lot of things. Our path has, you know, almost been the same, but, um, the church, uh, knew that and we were so small. I was about to say we had the largest graduating class from Rosedale High School and we had sixty-seven and that was huge. CHASE TRAUTWEIN: That was big. FAYE VICKERS: We had sixty-seven people. As a matter of fact, we just celebrated our fiftieth. CHASE TRAUTWEIN: I heard about that in New Orleans. FAYE VICKERS: We just came back from New Orleans, that's right. We just celebrated fifty years since graduation so because we were so small and some of our teachers lived in the community they went to church so therefore their hand was always on you, you know, so therefore you saw them and you had the highest respect for them and they were always interested in what you were doing and they were always encouraging and you know they watched your career, so, "Are you going to school? Where are you going to school? And when you are finished what are you going to do?" Most of them were educators, so that's why a lot of them were educators and so I told them, "I don't want to be a teacher." I wanted to be a secretary. And so my teacher said "A secretary? You don't want to be a secretary." I said "I do. I want to count money." So I majored in accounting but and then she said, one of the ladies I went to church with, she was a teacher and she said, "I can't help you. If you do that, I can't help you, because if you're not going into the teaching profession, I cannot help you. I do not know anything about accounting. You go that way but I promise you I can't help you." And I said, "OK." But Ms. Jones and many of the others went into education and the people who were in education, they made sure that they got jobs, because they knew the superintendents and they knew the schools and "It's OK I work over here. Now you come over here and work with me." So our teachers were involved in every aspect. Even when you got married, you know, you wanted them to come to your wedding and you wanted to take your children to them and say, "This was my first grade teacher," and even though they can hardly see they say (unclear) so the teachers were very much involved and the church was. The church, um, you know, made sure that we stayed active and when I say active, every time the church door opened, we were there. We were there for Sunday school, we were there for evening programs, we were there for any kind of training that they offered and the training was something called BTU, which was what they call Baptist Training Union and that's where they go and you learn how to uh conduct yourself at a meeting, how to carry a motion, how to, there were things that the church taught you that were life skills, that you could use beyond the church, you know. Again, they kept drilling us on, "You know how to conduct a meeting. You need to know how to call a meeting together and you need to get a vote." How to get a quorum, you know these kind of things. CHASE TRAUTWEIN: Very Baptist things. FAYE VICKERS: Very Baptist things, exactly. You know we Baptist people have to vote on everything (laughs). So they drilled that in us, you know, so a lot of things that were foundational came from the church and we used that at school and then again, uh, Rosedale was a school that was under the administration of the Jefferson County Board of Education, so therefore, everything that Jefferson County mandated from the schools, Rosedale had to abide by, but that was the brainchild of Rosedale, which was Professor B.M. 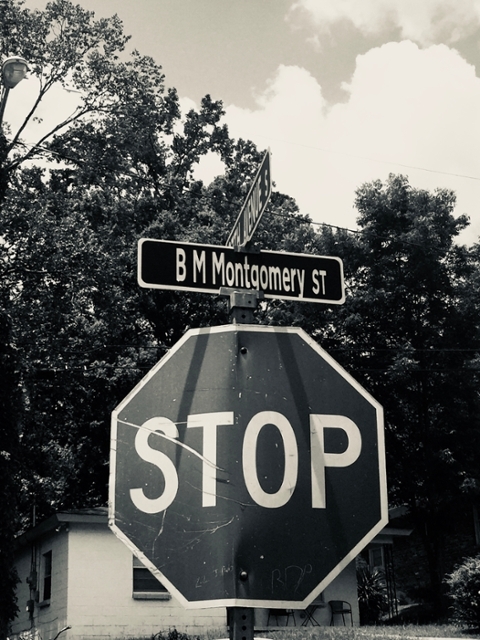 Montgomery, who lived in the community as well. The principal lived around the corner from us. CHASE TRAUTWEIN: Right, he was the principal. FAYE VICKERS: He was the principal and he was a founder of the school and so he saw the need for a school and what he did is, uh, he went to the board and say, "People in this area have to go so many different places to school." My grandmother went to a school, it's called, it was called Saint Mark. Saint Mark is a community and it still exists at the foot of Vulcan. As you get to Vulcan and you're going down the hill and you go around the curve, it's a community right there. There are several restaurants down there and I can tell you, there's some restaurants there now but up in there is a community. It was called Saint Mark's. My grandmother walked from Rosedale down to Saint Mark to school and it went from first to eighth grade but then, and I'm talking about 100 years ago, if you finished eighth grade, then you could teach the others. So my grandmother's family was called privileged. My grandmother finished the eighth grade and so did her sisters and my aunt took music and so she played the piano for the church and my great grandmother did all the communion for the church and they all went to Saint Mark's school but there were other people in the community, it was just, they had to bussed a long way. There was no school in the community so Fess Montgomery, we called him Fess for Professor but his name was B.M. Montgomery found the school and so he went to the Jefferson County Board of Education and asked them to allow him to put a school together and they said, "You won't have enough school to support funding." And he said yeah because the children that are from Shades Valley, that's a little pocket in Shades, I'm not talking about the Shades Valley down in Bessemer, the Shades Valley that's off of Oxmoor Valley and Oxmoor community. Oxmoor community is between Shannon and Ross Bridge. You know where Ross Bridge is? CHASE TRAUTWEIN: Mmhmm. FAYE VICKERS: And that's a community right by called Shannon, right over is a community called Oxmoor and they had no school in that area. the kids in an area called Mason City and Mason City is in the neighborhood that's near, let's see, if you get to enter West Oxmoor coming toward downtown there's an area over there, two cemeteries, there's two cemeteries over there. Let's see. I'm trying to think of something that you would be familiar with but anyway, the area over there, there was no high school. There was an elementary school, but no high school, so they had to be bussed quite a ways to a high school and then there was another area in Irondale that it was no high school. They had to be bussed to Multon which was in Leeds. CHASE TRAUTWEIN: That's a long way. FAYE VICKERS: It was a long way. Kids, you know, kids, you know, seventy-five years ago, used to be bussed a long way to go to school, so he came up with the idea, "If you allow me to open a school and, you know, then I'm going to put a school together." And he did and they, that's how the school came to be. Now and it operated that way and when I say they came from this community, Jefferson County provided the buses for those kids to be bused to Rosedale so at any given time it was never any more than 700 students in the entire school. That's first grade through twelfth grade and again Jefferson County Board of Education, you know, they took care of them and the teachers were hired through Jefferson County Board and everything, like any other school, but it just happened to be in that community, that served those areas that was in need of a high school, you know. And it existed until, at, Shades Valley also was operated the same way under Jefferson County Board of Education but when they came, when the Civil Rights Act passed and they had to do all this integration of schools, many schools did not want to integrate, so they came up with their own school systems, the small communities, the small cities, because Alabama's full of small cities and they came up with their own school systems and, or the churches formed their own school systems to afford some of the integration, so, uh, Jefferson County decided that they were going to close Rosedale because the city of Homewood established their own school system and Jefferson County would not support that because Rosedale was in the city of Homewood so they closed that school and all the kids that were going to Rosedale from the Rosedale community had to go to sit at Homewood. The other kids who were in the other neighborhood, they stopped bussing those because there were other schools that they could go to other schools as a result of integration. Even though they were traditionally white schools, they were mandated to integrate those schools with those kids who were being bussed other areas, so that's why they had to close the school. CHASE TRAUTWEIN: Uh-huh. So around what year do you think that would have been when the Rosedale students were going over to...? FAYE VICKERS: In sixty-nine. CHASE TRAUTWEIN: sixty-nine? FAYE VICKERS: Yeah, we, they would actually, we graduated in 1967 but in 1965, when they had to integrate the school, they went, they went to all the schools and they got students out of, and I think at Rosedale they got about twenty students from Rosedale and sent them to Shades Valley to start the integration process and so, you know, that was, parents had to make a very tough decision. CHASE TRAUTWEIN: Yeah, that's a big deal. FAYE VICKERS: It's a very big deal. They chose the best and the brightest students, well, not really, they got a few that were average. They couldn't just get the smartest. They had to get some average students as well and they sent them to Shades Valley and all of them graduated but many of them had a very difficult time and talk about the scars right now, you know, scars of, you know, of how they were treated and, you know, the cut's always tough when you first start out. CHASE TRAUTWEIN: They're the first ones going in there. FAYE VICKERS: Yes, exactly, exactly, but they, and that's how they started the process and they started that process, I think in '65 and then in '66, a few more went and we graduated in '67 and in '68 Rosedale was still, but '69 was the last year. They closed it in '69 and all of the students had to go to the other schools and that gave them time to build the schools because when they first started the Homewood school system, they had classes in the churches. They had them in Trinity and in Dawson. That's where they had all the classes of the high schools up until they built the Homewood High School. CHASE TRAUTWEIN: So did that, um, the integration and then the resulting, uh, shutting down of Rosedale School, did that have an effect on Rosedale itself? FAYE VICKERS: It did, it had a tremendous, a tremendous effect on the community. First, it was all these problems. The first problem they had, the Homewood school system felt that the education that they received at Rosedale was substandard and they wanted to hold all the students back a grade, so if they went in at seventh grade, they were not going to report them to eighth grade. They wanted them to repeat that. They had awful discipline problems. It was fights every day. Fights, because, you know, they're in a brand new environment, nobody, now that we look at it, they never got them ready. They never got the students in Rosedale ready to go to integrate. They never got the students from the other schools to integrate with the blacks, so when they got together for the first time, it was clash. It was a clash and so therefore there was discipline problems, so the neighborhood was organized at the time, we had something called a civic league, so we had to address these issues at the meeting and figure out how to address them and then we finally got the city council representative. We had a representational city council in Homewood and they expressed concerns and then we were able to get a person elected to the school board and they expressed concerns and that's how we finally worked out some of the problems but at first it was awful. It was awful. It really was. I had two brothers to go, so I remember very well, I was still staying at home, wasn't married or anything then, so I remember the problems and it was awful racial problems. CHASE TRAUTWEIN: I remember reading, it was either in '63 or '65 that something had happened on Central Avenue, that there had been a crime or something there, I don't know, that was, had to do with the Civil Rights movement. I don't know if that's true or not. In Rosedale, because for the most part, from what I've read, there, when things were going on in downtown Birmingham, that that did not really make its way over the mountain. FAYE VICKERS: It didn't. It never did. It never did. When we were in high school, which was at the height of the Civil Rights movement, they were contacting all of the black schools to participate in the demonstrations downtown. We were forbidden, we were forbidden by our principal. If you leave and you participate, you will be expelled from school and you will never be able to come back again and of course the churches, because that was a time, see a lot of people, a lot of whites that I understand, the fear, that was in the black community and the threats were very real and so if you participated, "If you're going to tell me I can't come back to school again, I don't think I need to do this. I need to not do that." CHASE TRAUTWEIN: Yeah then what do you do afterwards? FAYE VICKERS: Absolutely, so we were afraid and because we were in an isolated community and they said don't, we didn't and then when it really, really got intense, some did anyway. Some did. They just walked over the mountain and they just left the school and started walking over the mountain and the principal said "OK. I forbid anybody to leave. If you leave and go downtown and participate in any of the demonstrations, you cannot come back to school" and some said "I just won't come back but I'm going to do this" and because that day, when the students from Rosedale left, a lot of schools were allowing students to leave and they did and of course they were better for it, you know, those that did. They did come back to school but the principals were told "Do not allow your students to do this" so the principals were doing what the board told them to do and of course they had to do what, they had to say to us what the board told them, whether we obeyed that or not, but yeah, there were some that did leave. It was a very intense time, but because we were over here, well you know, people just didn't think about "Rosedale? OK." CHASE TRAUTWEIN: Yeah that wasn't really a blip on the radar, I imagine. FAYE VICKERS: That's right, that's right. Whereas my husband went to Ullman High School which was on the south side where UAB is right now, that's where his high school was and so, you know, he had 450 people in his graduating class and I kept saying "450? That's half the school" but he, but they went by droves and it was not the same restraints as it was because they were under the city of Birmingham which was still a white system but Jefferson County, it sort of flipped. Jefferson County basically was all white and city of Birmingham was black, so therefore, you know, just, did you grow up in Birmingham? CHASE TRAUTWEIN: Do you know where the Trussville, Clay/Trussville area is? FAYE VICKERS: Yes. CHASE TRAUTWEIN: About a half hour northeast of Birmingham, that area. FAYE VICKERS: OK is that Clay? CHASE TRAUTWEIN: Mmhmm, Clay, which it's Jefferson County. FAYE VICKERS: OK, yeah. OK. CHASE TRAUTWEIN: I guess geographically, too, if they're in the area where UAB is as well, it's right there where all that was happening. FAYE VICKERS: Absolutely, right downtown. So you can walk, and even if you're a long way, you still walk, kids were walking because that was the catalyst of the demonstrations downtown, it was the high schools that really made it happen. Yeah, so Rosedale had a share in that. The other thing about Rosedale is that because the school was so well built, we didn't think about it, but it was also a fallout shelter. When we were growing up there was a threat that Nikita Khrushchev was going to drop the bomb and we were all going to die but we needed fallout shelters so Rosedale School was also a fallout shelter because it was this great big rock building that's still standing strong and it was a fallout, so whenever there was a threat of any kind, weather or otherwise, the community was told "OK come to the school" so the school served the community in many different ways and therefore, you know, not only was it a meeting place for social events and for political events, for everything, and it was the fallout shelter. CHASE TRAUTWEIN: I didn't know that. FAYE VICKERS: You don't even hear the word "fallout shelter" anymore but you know, in the Fifties and Sixties, there was always a threat that Russia was going to drop a bomb and it was going to be gasses, so you have to have a fallout shelter to go and to be protected from all of this, so, you know, we would just be ready waiting for Khrushchev to drop the bomb. CHASE TRAUTWEIN: So have the whole town come into the school and hunker down FAYE VICKERS: A lot of people would come in to hunker down, exactly because it was, you know, three levels, plus the basement, and if you get in a hallway, you know, like tornado warnings they have now, Rosedale would have been the place to go because of the way it was built, you know, and we would get in the hallways, away from the windows and you know you were going to be OK. CHASE TRAUTWEIN: Wow, because I remember hearing that the schools previously built were made of wood but they kept burning. FAYE VICKERS: They were, they kept burning, that's right. Actually, they did, I think three times, the schools burned and you know, it was rumored, we don't know, that someone set them on fire each time, but either way, they burned, so when they put the last one up, they said "We're going to put this up for a lifetime." CHASE TRAUTWEIN: "This one's going to stay! We've had enough of them that have fallen down" or whatever. FAYE VICKERS: That's right. I still just can't believe it, so now it's been purchased by the Muslims and they used to allow, you know, when they have reunions, people want to go up and look at the school and take pictures of the school, but they don't allow that anymore, so we can just stand out and kind of look up and look in, can't go in anymore and I guess that is, you know, their holy place, they don't let people go up anymore, but and then when the school, when they closed the school, it just sat idle for about ten years or longer and finally Jefferson County wanted to get it off their hands and so they put the word out to the community but it didn't get to the people who needed to hear it that they wanted to sell it. They sold it dirt, dirt, even you could have bought it. I mean, they sold it dirt cheap. They wanted to get rid of it and they first wanted to offer it to the community because they knew what the school meant to the community but the person who they told was really getting into dementia. They really didn't talk about it or say anything about it when it was in the paper that it was sold, everybody just had a fit, they didn't know it was for sale and they said "Well we told" you know, (unclear), but nobody really got the word and people who had moved away from Rosedale but grew up there would have been interested because many people, it had, you know, the word had been passed through the community for years "Why don't several of us get together and buy this school?" and what they sold it for, that could happen, but no one knew until it was sold. CHASE TRAUTWEIN: Until it was too late. FAYE VICKERS: That's when it was too late and there's a lot of property behind the school that they threw in. They just wanted to unload it. So yeah, the same thing, we said "I can't believe that." CHASE TRAUTWEIN: When, about when was that, when it got sold? Do you remember? FAYE VICKERS: It must have been about fifteen years ago, maybe. It was in the Nineties. CHASE TRAUTWEIN: OK so recently or relatively recently. FAYE VICKERS: Yeah or 2000, yeah it has not been that long. It sat there for years and first they used it, Jefferson County used it as their resource center and they would do all their printing and they would house a lot of their old equipment and stuff up there and they said it was just a liability to them, they wanted to get rid of it and that's when they sold it and they offered it to the city of Homewood. I think the city of Homewood was going to buy it but it was going to be some kind of conflict, something, I don't know what it was, but Homewood considered it and said "No" they didn't want it and I couldn't believe Homewood did not want it. I just couldn't believe it. CHASE TRAUTWEIN: Yeah now that you mention that, that doesn't make much sense. FAYE VICKERS: It doesn't make sense at all, but, you know, they said they didn't want it and I was surprised at that. CHASE TRAUTWEIN: Because it seems that over the decades that, like you're talking about the businesses moving in and Homewood has steadily, little by little come in, you would think that they would want that property for rezoning or something. FAYE VICKERS: You would. I used to be involved in the Civic League and I used to go to the city hall meetings and they had something called, it's the Homewood Plan and the Homewood Plan is a projection of where Homewood is going and, um, it has been in their plan for many years to take Rosedale and so we fought and fought and fought. It's still there because we have fought for so many years but it's inevitable, they're going to take the entire community and revamp it completely because its' a very desirable area. CHASE TRAUTWEIN: Oh yeah, the geography's perfect. FAYE VICKERS: Absolutely and when they, when Homewood was getting ready to celebrate their centennial, the only place that was 100 years old was Rosedale, so they said "OK Rosedale is the first community of Homewood" then after that you got Hollywood and then after Hollywood you have Edgewood then after Edgewood, you know, you have all the other areas of Homewood, but Hollywood, it was the second community of Rosedale excuse me, of Homewood, so they said "OK, so Rosedale is the oldest one" because they were. They were there. Homewood built up around Rosedale. CHASE TRAUTWEIN: Talking about the school reminded me of hearing about an event that several had mentioned called May Day that happened at the school. FAYE VICKERS: Oh yeah, May Day, we lived for May Day. It was once a year and just like Alabama has A-Day-- CHASE TRAUTWEIN: Yeah. FAYE VICKERS: OK and I'm sure Samford has a day that they celebrate here, maybe S-Day, I don't know, but we had May Day and it was always the first of May and it was a big festival that the entire school took part in and the May Day, every class did a presentation and so we had, the parking lot was paved and they took chairs and put them in the parking lot so the parents and all the visitors come and see the presentation and many people would take off work because they got to go to support the kids and see them do their presentation and every class made a presentation of a dance or some kind of dance. The highlight of it all was plaiting the May pole. CHASE TRAUTWEIN: That's what everyone has said that that was just... FAYE VICKERS: It was, it was and it's a pole with ribbons and you have all these people to hold the ribbon and you do a dance in a certain way and when you finished doing the dance, the pole is plaited in a format like, uh, like something that's crochet, you know, in that order, and they would dance and when they would finish, the girls would curtsy in their beautiful May Day dresses and then they, they'd dance again and then it was freed and that was just the highlight. The ribbons were bright, you know, spring colors, and the pole was white and they wore pretty dresses. Very soft colors to accent the pole to look like spring, so that was the highlight and then we had entertainment and we had great food. Bands played and we had all kind of hot dogs and all kinds of summer foods and we just had a great time so we looked forward to May Day and we worked for maybe, every teacher in the school, from first through twelfth grade, did something, and so everybody wanted to see who was going to be best, who's going to give the best presentation and so every day at school, when two o'clock would come, those teachers would stop teaching, and practice and we did that for months. CHASE TRAUTWEIN: "That's it, we're getting ready!" FAYE VICKERS: That's right, got to get ready, so sometimes, we did some things that were our own law. "This is the way we do it." "This is the way we do it" and I look back on it now because we talked about that in our reunion. Our theme was fifty years later and Friday night we had something called, I was over it, I was chair, so we wanted to talk about fifty years ago. What did we learn at Rosedale? Where did our experience in Rosedale take us? And if we had known now, fifty years ago, that Rosedale would have done anything different and do you know almost everybody would say the same thing. "Gosh we had no idea how privileged we were, because our classes were smaller, the teachers knew us, and we knew them" and if you were in a school, you already knew who your teacher's going to be in the fifth grade. You already knew who your twelfth grade teacher's going to be and they're watching you and then they would have taught your siblings, you know. CHASE TRAUTWEIN: Yeah so they would have known your family. FAYE VICKERS: Sure, known your family, that's right, so they would just say "I'm going to call Christine and tell her about you." And you'd say (unclear) because the school was so small and they knew you and they knew your parents so you'd say "OK" and I was telling Linda Jones "I don't know why they kept calling us privileged" and she said "Because how many schools do you know where the teacher knows you, your mama, your brother, your sister, everybody in your family?" and you know there were families that were extremely bright, extremely bright, brilliant, and you expected things from them and coming from a neighborhood like that, having so many professionals, I mean, you know, every neighborhood, you get people to do well, but when they're small like that, you just sort of expect so many and in my class we had sixty-seven people and over sixty percent of them went and graduated from college. That's phenomenal, you know? And especially for that time, so we just say "Yeah we were privileged. We were able to do this because the teachers guided us and they pushed us and they had their hands on us, hands and eyes and everything on us." CHASE TRAUTWEIN: "I've got a little bird watching you." FAYE VICKERS: That's right, exactly, that's right. That's unheard of now, that is totally unheard of now. The stuff I got in school free, I had to pay dearly for my son to get, so it's a different world, a different time, but I think we benefited greatly and didn't even know it. CHASE TRAUTWEIN: Yeah, I mean, for y'all, y'all must have thought "What else? This is normal?" FAYE VICKERS: Uh-huh, uh-huh. CHASE TRAUTWEIN: It's interesting to think about and they always say that hindsight is 20/20. FAYE VICKERS: Always, always. There was a guy who was president of our class, Linda Jones probably told you that also, his name was William King and he played with the Commodores, so I called him and I said "Now make sure you're at the reunion." He said "You know what, I'm just going to--" I said "Listen. You are not busy. You are, the group has not recorded in years. Nobody wants to hear you in the South. We don't care. We don't care about, we're not in love with the group, we are not in for the group," so he said OK. We decided we don't want to have a speaker, we want to let them talk, and just let them talk. We had designated people to speak so he said "Faye I just don't know what I'm going to say" so I said "Just be brief. Just get up and speak from your heart." We had to sit him down. He talked so long, doing the same thing I'm doing right now because he also, we all grew up together, we all went to the same church, he was a secretary at the Sunday school, he played the piano, we were all silly and just had a great time growing up and this is what he talked about and he said "You know, I will forever be thankful for my experience in Rosedale. It made me the person I am." Me too, me too. All of us. CHASE TRAUTWEIN: And he was thinking "I won't have anything to say." FAYE VICKERS: That's right. He said "What can I say? Tell me what to say." I said "I'm not going to tell you what to say. Just, you know..." He was supposed to speak from fifty years ago, blank, and "I just want you to talk about your experience" and boy did he talk, but he talked from the heart as a matter of fact. As he talked, he teared the entire time. And he said "I've been all over the world, I've traveled and I've met a lot of people" and he said "I have friends who talk about their reunions, their class reunions" and they said "I've been to about six of mine and I can't wait to get back. I can't wait to see them. We have so much fun together" and he said many of them, "A majority of my friends would say 'I don't care if I ever see some of these people again. I mean, they're alright but I don't, I wouldn't go through any changes' and my experience was different. I can't wait to see them" and the entire time he was talking he was tearing about what, you know, things we experienced that kids will never experience what we did and we didn't even, we were acting silly. We had no idea that we were creating a bond between each other and we were building a foundation for life. Life, you know, and, so we had a lot of great people to come out of the community of Rosedale, who went to Rosedale school, from that small pocket of people, who have done great things. I had a cousin who graduated as a matter of fact, he was the president of Linda Jones' mother's class and he participated in the first heart transplant. He was successful and graduated from Rosedale and went to Laharry but he went to Boston College and he went to Laharry, graduated, and then he was a heart surgeon, specializing in thoracic, something, anyway, had to do the open heart surgery and he was in her mother's graduating, there are a lot of people who have done great things. One of the Tuskegee Airmen came right there from Rosedale. Did they tell you that? CHASE TRAUTWEIN: I didn't know that. FAYE VICKERS: Have you ever heard of the Tuskegee Airmen? CHASE TRAUTWEIN: Yeah. FAYE VICKERS: OK, yeah, family right there in Rosedale, went to Tuskegee, so. CHASE TRAUTWEIN: I didn't realize that. FAYE VICKERS: Oh yeah, so we've had a lot of great people to come through there but because we were small and not, they don't know about us, we just have to go and make our claim and, you know, say "Yeah, Rosedale." CHASE TRAUTWEIN: It's something that, um, you know, you don't, knowing everybody and maintaining those connections over the years, you don't hear about it often nowadays because a neighborhood nowadays, it can be huge and you can not even know your next door neighbor's name. FAYE VICKERS: Exactly, exactly and you don't care to know them. CHASE TRAUTWEIN: Yeah it sounds like that was definitely not the case in Rosedale. FAYE VICKERS: Sure, sure. As a matter of fact, I don't know if they mentioned this to you or not, we had something called the Rosedale Picnic Club. The Rosedale Picnic Club is an organization of people who left Rosedale and they went to different areas and it was so many of them in one area, they decided that they would get a club and once a year, they would have a picnic or they would have a reunion in one of those cities to commemorate and celebrate Rosedale. There was one in Chicago, one in Cleveland, one in Los Angeles, California, one in Cincinnati, one in Atlanta, and one in Birmingham. We had seven or eight of them and every year, that's how Linda Jones and I got a chance to travel. We had never done any traveling but when we were sixteen years old we got in the Rosedale Picnic Club and the first big trip we took, we went to Cleveland, Ohio and they had a weekend of activities and the other clubs would get together and these clubs were people that were from Rosedale, so that was where my mother kept up with her friends and other people kept up with them because they would move into these areas and then they'd say "there's a Rosedale Club there" and they would hook up with them and join their club so once a year we would get a chance to go and see these people but Linda and I didn't care about the people, we just wanted to go to the cities [laughs]. CHASE TRAUTWEIN: Yeah that's got to be a big deal. You say you were sixteen and y'all were able to-- FAYE VICKERS: Sixteen, that's right. CHASE TRAUTWEIN: What was that like leaving home? FAYE VICKERS: It was wonderful because they always chartered a bus, so she had a little summer job and I did too and so what we did is that we would save our money to pay and I think it was no more than fifty or fifty-five dollars. Oh, that was a lot of money and Linda could say that she worked at High Cale Drug Store. High Cale has been closed for years but it was in Homewood where, you know where Bigby Drugs is now? CHASE TRAUTWEIN: I've heard that name. FAYE VICKERS: Bigby Drugs is on the main road, Eighteenth Street, there's the elementary school, Shades Cahaba Elementary School and right across from it is Bigby Drugs, it used to be called High Cale Drugs, then it was also on the main road up there where the star, you know where the star is? They had the star. CHASE TRAUTWEIN: Mmmhmm. FAYE VICKERS: OK, it was right there. That's where Linda Jones worked. She worked behind the counter and I worked at Shell's Cleaners and I used to fold the laundry. That's how we made our money after school and we saved money and we would take the trip every year and again, a lot of people didn't know me, I didn't know them either, but they knew my family. They knew my mother, they knew my aunts, my grandparents, they knew all of them because they were from Rosedale, so we were another generation going and we wanted to see what this was all about but we mostly just wanted to go to see the city and that's how we got, so they had about, they really had about nine strong clubs and that existed over twenty-five years but what happened is that the people started dying who was really in love with this and the younger people were not interested, like now, they're not so interested. CHASE TRAUTWEIN: Yeah that happens a lot, the younger generations are not as interested in what's come before. FAYE VICKERS: Not even in family reunions, they're not so interested. CHASE TRAUTWEIN: Yeah, gosh, I think I've been to one family reunion and I was three. FAYE VICKERS: Really? And you haven't been once since then? CHASE TRAUTWEIN: And I barely remember that. FAYE VICKERS: Really? CHASE TRAUTWEIN: Yeah, but something like that, you know how much fun that would be? I would love to do that. FAYE VICKERS: Oh sure. CHASE TRAUTWEIN: It was up in, uh, I think Knoxville. FAYE VICKERS: Oh yeah, OK. Do your family not have them anymore or you just don't have the time? CHASE TRAUTWEIN: I don't think they really have them anymore. We, my father's side of the family, they're from Knoxville and Tennessee, that area, and my mother's side of the family it's opposite. They're from Lower Alabama near Dothan and then also Crestview, Florida. FAYE VICKERS: Oh yeah, OK. CHASE TRAUTWEIN: Like if you're headed to Panama City, you go through both of those, but yeah, I haven't thought about that until you said that. I thought "Man, that'd be something." FAYE VICKERS: Oh yeah, they used to do that in Rosedale but that was to show you how deep those roots are and the kind of people that grew up in Rosedale, they were not in my circle, I mean, some of these people, I would say they're alright, but after you see them again, you say "Oh hey, So and So" but they're from Rosedale, and Linda and I were laughing about this not long ago. We went somewhere, I forgot where we were and there was this person who had shown up, not been to Rosedale in years and was going through the neighborhood just to look at the neighborhood and they know after church people stand outside and talk so they just parked in front of the church so they could see people so he got out of the car and I said "Linda who is that?" and she said "I don't know but it's somebody we should know" and he came out and he just hugged us. We still didn't know his name but we knew he was from Rosedale and so when he left we finally got his name and I said "Linda when he lived over here, did we talk to him?" and she said "No but he's from Rosedale so he's part of us" and I said "I guess so." CHASE TRAUTWEIN: Yeah you have that in common. FAYE VICKERS: Exactly, that's right and he had been gone for years and years and was interested to see what the neighborhood looked like and who was still there and I'm pretty sure she probably told, you know, Homewood closed a couple of schools and so a lot of Mexicans, and I'm saying this in love, I'm not, I'm just not, but they lived in some apartments that were off behind Green Springs, but it was still in the city of Homewood and they, after they tore the apartments down, they still wanted to stay in Homewood, because they wanted to stay in the Homewood school system and there were all of these vacant houses in Rosedale. These were houses that were owned by this one family, the Lee family, because they owned a lot of property throughout not only Rosedale but throughout Birmingham and the state and the family basically has died away and the houses were just boarded up because the person who was over there was trying to sell them as a block of houses throughout the community. She knew that Homewood is eventually just going to take the property anyway so they were trying to get the best value for them, not going to rent them, just going to let them stay here so the brother, the person who was really over the family just died and it fell into the brother's hand who really, they didn't want him to handle it but he was next in line and so he said "I don't care. I'll rent it out" and sell it or whatever, so a lot of them came to the Rosedale area and then some more of them came and now the neighborhood is, I believe, I eighty percent Mexicans and I walk through the neighborhood and I say, "What?" you know. This is what they said about blacks when blacks were displaced. Whites used to say, "What?" Well you know we're saying "What?" CHASE TRAUTWEIN: So it's a maybe a cycle. FAYE VICKERS: It is. I think because they didn't want to leave Homewood so they came in the area where they could stay in Homewood and their kids could stay in the school system and cheap housing because the houses are renting cheap and so, you know, they're there and I'm really and many of them have purchased the houses and they have made it them, you know, and I say "OK," so it's very little that helps me identify this as Rosedale, you know, because the people that I knew and the old families that I knew, three or four generations, they have died away, and the property either has been condemned or fallen, or they have sold their property and they don't come back. You know, so it's just a deteriorating neighborhood now. So I think with this project, it's just going to tell the story of who Rosedale was, and how important it was to the community that (unclear). CHASE TRAUTWEIN: To keep those memories alive in Rosedale. FAYE VICKERS: Exactly. CHASE TRAUTWEIN: So that now, however many years later-- FAYE VICKERS: Yes. CHASE TRAUTWEIN: --people can go back and hear about what it was like. FAYE VICKERS: That's right. And what communities used to be like. There's an old African proverb that said it takes a village to raise the child. It was a village that raised each of us, because everybody looked after everybody's children. We had two major kindergartens in the community and almost everybody went to those two kindergartens. And so they got you ready for school. And then when the mothers worked, neighbors who didn't work looked after the kids, and then there were so many family members, everybody seemed to be kin to each other, you know. [laughs] So, it was just the kind of place-- CHASE TRAUTWEIN: But that just sounds like utopia though, you know? FAYE VICKERS: I thought it, I mean, it was, it was really, really, very unusual and unique place. My husband reminds me so many times. "You are not in Rosedale!" CHASE TRAUTWEIN: Yeah. FAYE VICKERS: "Wake up! You are not in Rosedale." [laughs] CHASE TRAUTWEIN: [laughs] "Lock the door." FAYE VICKERS: That's right. That's right. But- CHASE TRAUTWEIN: Because it's not like you have two or three brothers and sisters but you have a whole-- FAYE VICKERS: Exactly. CHASE TRAUTWEIN: --street, or whole block. FAYE VICKERS: Exactly. And it's a strange kind of love and respect that you have for them. It really is. 'Cause we were telling William, you know, he said "you know, most of my friends don't go to their high school reunions because they don't have any- they can't connect." And he said, "But I connect with each of you." I said, "Yes because I remember before you got in- I knew you before." You know, "So I love you because of who you are, not because of what you have acquired, but for who you are right now. So leave that out the door, come back, close the people out there and come in as that." You know, and then, you get to be real then, you know. CHASE TRAUTWEIN: Being able to talk with the person and not just you know, "oh, he's in the Commodores." FAYE VICKERS: Exactly. [phone rings] CHASE TRAUTWEIN: [laughs] FAYE VICKERS: I thought I cut this off! Goodness gracious, I thought I cut this off... CHASE TRAUTWEIN: They're finding any way to get to you. FAYE VICKERS: Absolutely. And now I cut that off, it's supposed to...go out...okay. CHASE TRAUTWEIN: [laughs] FAYE VICKERS: I'm sorry. CHASE TRAUTWEIN: You're okay. FAYE VICKERS: I'm so sorry. CHASE TRAUTWEIN: I guess another question, and this one's sort of broad, but it's always a fun one to ask. Do you have any memorable or notable or funny memories or stories that just, when you think of your time in Rosedale, that just come up in your mind about a particular person, or a place, anything that, when you think of Rosedale, that just, it's the first thing that comes in your mind? FAYE VICKERS: Okay, yes, many. I don't want to give you too many. CHASE TRAUTWEIN: I was about to say, there's probably a lot. [both laugh] FAYE VICKERS: Many. Okay, I'm going to talk about a person and then I'm going to talk about a time. Okay, time, Christmas. Christmas was very, very special in our neighborhood, because all the streets were dirt roads except two. And also, that means that we had potholes and everything. We had no sidewalks, so when it rained, it was awful, because--it was just awful. And so you had to walk in mud and everything and...but they paved one of the main roads, which was Loveless Street. When they paved Loveless Street, everybody got their Union Hardwares. I don't know if you've ever heard of Union Hardware but let me tell you what they are. CHASE TRAUTWEIN: Ms. Jones was talking about- FAYE VICKERS: Did she? CHASE TRAUTWEIN: -the skates. FAYE VICKERS: The skates! Yes! CHASE TRAUTWEIN: Yeah. FAYE VICKERS: And so what they'd do is that they would close off the end of the street and the beginning of the street. Just one long street. And everybody would take their skates and we skated all day. We skated the entire Christmas break when school was off for two weeks. We skated every single day, because we could just skate, skate, skate, because you know, you can skate--Union hardwares you can skate on paved streets. You can't do a thing on dirt. And so, and kids had bikes, [clears throat] they would go up and they would ride their bikes because it was smooth riding, it was curved stones because there was no curved stones in the community and we were just so happy that they paved that street. It was that street and it was 25th Court. 25th Court was the last street on Rosedale and it was at the top of the hill, that's where everybody's going to go to watch the fireworks, OK. Well, that street was paved, but that was a steep hill, we couldn't skate there CHASE TRAUTWEIN: Yeah because that's up there, I mean, that's up there. FAYE VICKERS: It's at the top, it up there, that's right. So even though the people lived up there, you don't want to go up there to skate. Because it's like, you know. So we would go to Lovely Street and that was the most fun time, and everybody in the neighborhood, the street would be packed, so you just had to push people over. CHASE TRAUTWEIN: [laughs] FAYE VICKERS: But we didn't care because we were skating, and everybody got Hardwares, Union Hardwares is what they called them, and we just had the best time. And Christmas was just a special magic in the city, I mean, every house was decorated, and it was just something that's magical about Christmastime in Rosedale and everybody- we would walk down the street and you'd smell cookies and cakes, and you'd smell, it was the smell of vanilla, you know, and it was, it was just a happy time. And if you didn't get a lot for Christmas, it didn't matter because first, a church always made sure that they gave a lot of fruits so we could always expect apples and oranges and peppermint sticks and those walnuts, you know, English walnuts, you know, that they would always give us. So, we, we always had that but you know, we, we...it was just a happy time. The churches would have special programs and you always, you know, they had cantatas and they had children, featured children in special programs, so we looked forward to Christmas because the, the programs were going to be so great, at the church. They would display everybody's talent. And um, we just, it was a magical time. And I still think about my childhood and those skates every Christmas. CHASE TRAUTWEIN: Yeah. FAYE VICKERS: The person that stands out- there were several people who were pillars of the neighborhood. And I say pillars, I mean they got things going, they, they, they were spokesmen for the community, they were, um, people that made the wheel roll. One was, I guess you've probably heard the name many times, Dr. Mamie Foster. Dr. Mammie Foster was a Rosedale graduate herself. She grew up in Rosedale, graduated. She, uh, was a professional woman but she was very well-respected in the educational realm. She was the first black superintendent that was hired by Jefferson County; she was the first black super, um, city council-person in Homewood. But God gave her something special that he didn't give a lot of people, that she had the common touch, she knew how to speak and talk to anybody. Everybody loved her, and she, um, she was the second-grade teacher at Rosedale and I can remember to this day things that she taught us. She just had a special gift for teaching. She could teach anybody anything, she was just talented, very, very talented and we hated for her to leave Rosedale but when she left Rosedale, that's when she became superintendent at the Board of Education. And when she, uh, became the superintendent, she, she trained teachers how to be professional, how to carry yourself, how to speak, how to act, and how to deal with conflict. So she was a spokesperson for the community and when there were problems with, with, with law, with the law enforcement, or something about children and problems, she would address them and she would speak for the community and because of her, her...who she was, she was very respected and they heard and listened to her, so she could get things done. She lived in the community, so she just wasn't a person coming in, she was part of us. CHASE TRAUTWEIN: Right. FAYE VICKERS: So she, and she, uh, she continued to live there until--and she retired as a superintendent--um, but, she got Alz--got Alzheimer's. She was, she never had children, her husband died, and then finally she became, you know...and so they, her family came and took her to California and she died there, and it was sad day for everybody. But she is one of the most talked about and most remembered and respected persons of our community. Still talk about her in, in, um, great ways. I remember, uh, many great things that she did in the community, but she taught to the highest and to the lowest, I mean, I, there used to be, men would come up to her as drunks, when I say drunks I mean there were, they, there used to be something called the "catch-all corner." The Catch-all corner is where the men would go for daily work, you know, uh, day work, you know uh, one day work and they would stand out here, somebody could want them to come to something. And then when they got paid off they would go get the wine and they would stand over there and get drunk. And so she would pass by and they would act like she was God, they loved her so. And um, she always drove a Cadillac. And she would go by and pick up a couple of those men and let them come and rake leaves at her home and do things for her, and she would sit them in the front seat and she would, um, she knew how to talk to them in such a way, you know, she would call them "Mr. Denson" and she'd say, "You know, my husband has some shoes that he's not wearing; would you like them?" You know, and she just made everybody feel so special. And when people in the community would pass away, she could come to the family and con- and console them. She just had a way with people. And uh, and she was the person that would stand out. CHASE TRAUTWEIN: Mm. FAYE VICKERS: Halloween is a time that I remember from Rosedale, gosh, trick-or-treating, um, we, we trick-or-treated a different way than people do now, but everybody went out to trick-or-treat, and we looked so forward to it, and the youngest to the oldest went trick-or-treating. But we were territorial. So the main road separated the community, 18th Street, 18th, you get a part of Rosedale was on this side of the highway, and part was on this side of the highway. So, we, I lived on the right side, and I dared not go trick-or-treat on this side because they felt, "we, we do it on this side, but you all do it over there. And if we catch y'all over here, we're going to take your candy." CHASE TRAUTWEIN: [laughs] FAYE VICKERS: And so I would go trick or treating with my brothers because they wouldn't let anybody do that do us. And at a certain time of night, I mean, you would trick-or-treat, as the sun is starting to go down you go out, but when it get to be nine o'clock you need to be home, you don't need to be out, because at nine o'clock a different group of folk would come out. And we'd have so much candy, so much candy, and we would just bring it home and just lay it out and separate it and then we would go to school the next day and swap candy. CHASE TRAUTWEIN: [laughs] FAYE VICKERS: You know, "I don't like this or like this, give me yours" you know. And that, we looked forward to Halloween. And we could not afford costumes. So we made our own costumes. We made our own and it, some of the stuff used to be just hilarious, we would go out just to see what they had. Nobody bought anything they just made some, and some of it was crazy, and some of the people wouldn't give you candy if you didn't have a costume, they'd say "you're going to come to my door and you didn't take the time, no I'm not giving--" CHASE TRAUTWEIN: [laughs] FAYE VICKERS: You know so you've got to have a costume or you've got to look like Halloween. And those were fun times. Those were fun, fun times. CHASE TRAUTWEIN: That's funny. [both laugh] CHASE TRAUTWEIN: That's funny. So you had to at least put in some effort for a costume to- FAYE VICKERS: You did. And my brother didn't want to waste time, and, and, having our mother make us anything, so we had a fireplace, I'm talking about the fireplace where you use coal and wood, you know. And it created soot. You know what soot is? CHASE TRAUTWEIN: Mmhm. FAYE VICKERS: OK. So he would go get soot. And he would just put soot on his face, and my mother's lipstick, and then he would go get a towel from the bathroom and just, like a pirate, and he would just, you know, put that on, (unclear) "okay I'm ready." CHASE TRAUTWEIN: [laughs, snaps his fingers] Done. FAYE VICKERS: That's it. That's it. And so I'm, I wanted to (unclear) "I'm not ready to go" but, and so, but he couldn't go and she, my mother wouldn't let any of us go unless we went out together. And we had to come back together. Because we had to look out for each other because everybody in the neighborhood was running and we were running on those dirt streets and we would get so much - we worked like dogs for that candy, we worked hard. But it was the most fun time. It was fun, I told my son, you know, we, we just had a great time and I think that's why, you know, you create relationships, because you had so much fun together. With nothing, you know, we didn't, you know, we didn't have all the stuff that kids have now. So we made most of our toys, made them. You know, my brother would, um, make scooters out of old wheels and he would get some nails and some wood and he would make a scooter, and we would have the most fun on that scooter. And everybody in the neighborhood made them, you know. Or we would take tires, tires that people used to- on a car, and when they'd throw the tires away we'd get them and we'd roll tires. You know, we just had the most fun. Growing up we just had, we just, we were poor as everything and didn't know how poor we really were, because we made our own toys and made our own fun, and played with the people who were right in our street, you know. [coughs] CHASE TRAUTWEIN: Making the most of what you had and- FAYE VICKERS: That's right. That's right, exactly. Mmhm. CHASE TRAUTWEIN: Something that you don't- FAYE VICKERS: [coughs] CHASE TRAUTWEIN: - too much nowadays. Do you want any water or anything? FAYE VICKERS: Yeah do you have some water I can- CHASE TRAUTWEIN: Yeah, I can get a... FAYE VICKERS: [coughs] CHASE TRAUTWEIN: I can get a glass from right up here... FAYE VICKERS: [background noise, unzipping purse] I might have a mint. CHASE TRAUTWEIN: And if you need to call those people go ahead. FAYE VICKERS: [background noise, unwrapping a mint...] CHASE TRAUTWEIN: There you go, here is a water. FAYE VICKERS: Thank you. I talked myself into a cough. CHASE TRAUTWEIN: That happens. That certainly happens, yeah. Well. We have kinda been doing it the whole time, but um talking about Rosedale, um, but I guess another question would be you know as far as describing Rosedale and its people. Um, what kind of words come to mind? How would you describe Rosedale both the place and the people there? FAYE VICKERS: I would call Rosedale a village, where as everybody depended upon each other to come and go. And their goal was just survival, just living, everyday living. Um, again I keep saying that we depended upon each other because we did. When people, most people had gardens. It was a country, a country village, (laughter). People had gardens. They shared their food with everybody in their neighborhood. Um, you know, people would wash their clothes. And I remember they would share even clothes lines. [phone rings] Oh, I'm so embarrassed! This phone is new to me and I'm told to just press the button and it goes... Now it says slide, slide to power off. [laughs] I was pressing the button without sliding to power off. But um, people were um, they helped each other so much. They cared. I remember when people would get sick um, people would come in and sit with you. You know while that person was either passing or um, very ill and had to have around the clock care. Neighbors would just come in and sit. Or they would come and they will help you with your, you know, take care of your house. You know, I remember my grandmother um, was sick. No, my great grandmother was sick. And people from the church would come in and bring cakes and bring food. They'd say don't worry about cooking, we've cooked your meal. And that was, you know they will bring a lot of food. And some would say, ok here are your clothes, I've washed the clothes. And they would just sit because my grandma, my great grandmother was very ill. And at that time, you know you were very ill, you wouldn't die in the hospital, you would come home until you died. And, and people in the neighborhood. And uh, on the street, if someone was very sick on the street, they would say, they would tell the kids, "Go play somewhere else, Mrs. so-and-so is very sick and they don't need that noise." And we would graciously leave. So, um, Rosedale to me was a village where people cared about each other, um, they embraced each other, and when they say, you know, your troubles are mine and mine are yours. It, it, it was certainly that. I just felt kin to a lot of people. There was no blood connection, but it was a heart connection. And I still try to share that in the church were we go now. It's the same church I've always been in. But, the church just like, it's not the same church that I knew. Because the people are different. So you know, I'm talking all this smack, my son call it smack, about... That doesn't mean anything! You know, Mom... you don't want to hear that. You don't care! People don't have time for that, you know. But um, that, that's the kind of neighborhood that it was. People sincerely cared. And because it has diminished, I talk to people now who were in my generation and my sister's generation, you know, older people in their 80s, they still had the same love for the neighborhood and great memory. And they agreed when they see what the neighborhood has become now. So since there is nothing that we can do about it, we talk about the good times and how things really were and we didn't know how great it was until now, you know. Um, really I don't have any other questions unless there's something that you feel like you would you like to say or address about Rosedale. Well, you know, I just, I just have to say that the way I feel about Rosedale is how I've always felt about Rosedale. I'm there most of the time now because my mother still lives there. And so I go and check her. And, you know take her. I still know a lot of people in the neighborhood and when they see me, you know they wave and they show me, you know they say, "Oh, there's Ms. Faye!" And you know they'll wave and they'll talk. But they are not members of my church, they don't see me, they, they treat me that way. But they know how I feel about the neighborhood and other people who, who, who um you know who go there, who used to go to, who use to live in Rosedale. They feel the same way. And when we talk, it brings up happy feelings. You know we talk about happy times and how the world has changed but the things that we've learned in Rosedale we could share and impart with other people. And say, I remember when the world was different and it operated this way. And some of the foundational things that I have learned that I learned at Rosedale School and from the community. It has propelled me, even in my career, and I'm retired now, but some of those same principles that I learned there I exercise and use those in my everyday life. And I think I'm a better person because I grew up in Rosedale. CHASE TRAUTWEIN: So it pays to stay in school? FAYE VICKERS: It pays to stay in school! And do what the folk tell you to do. CHASE TRAUTWEIN: At the time you may be thinking, nah. FAYE VICKERS: Exactly. Exactly. Well, I guess with everybody you can look back and say um, gosh they were right. You know I'm glad that I either did but they say do, or I wish that I had done what they told me to do. You know, now, you know there were sad times and bad times and a lot of things that we did. They were probably not the best things, but we did what we thought was right. You know. CHASE TRAUTWEIN: I appreciate you talking about it. If anything, it's fun for us being able to hear about how it was and the stories that come out of it and what life was like. You know, it makes me wish that I had a time machine sometimes. FAYE VICKERS Oh I know that sometimes I wish that I could turn back the hands of time Uh, I talk to people who, you know were in the neighborhood who I haven't seen in a long time. Or who you run across every now and then and the first thing you start talking about I was asked about these things. So do you ask questions like that. And they all have that same strong love you know for the community. CHASE TRAUTWEIN: Well, like I said, I appreciate out. I will go ahead and turn this off. Let's see.